Hot Dog Season is here! Spring is around the corner, the snow is melting here in the Northeast and it’s almost baseball season. All of this adds up to a great time to eat a hot dog. As you can tell from the lack of posts this winter, I did not have a chance to make many hot dog excursions the past few months. That will change this spring/summer and I’ve kicked off the 2011 tour with stops in Bark (Brooklyn, NY) and Blackies (Chesire, CT) from my recently completed roadtrip. 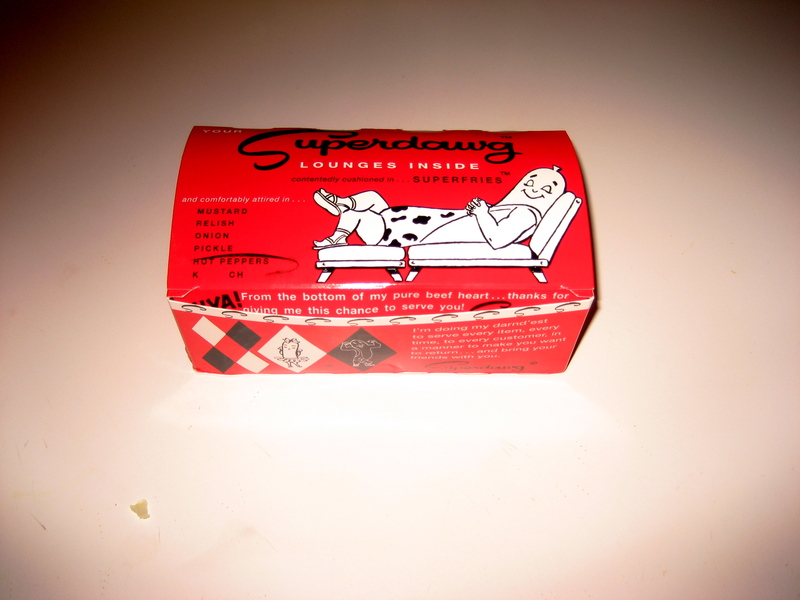 One is relatively new to the dog scene and super-trendy, the other a classic that has been around since 1928. In the next few days I’ll post reviews for each stop. 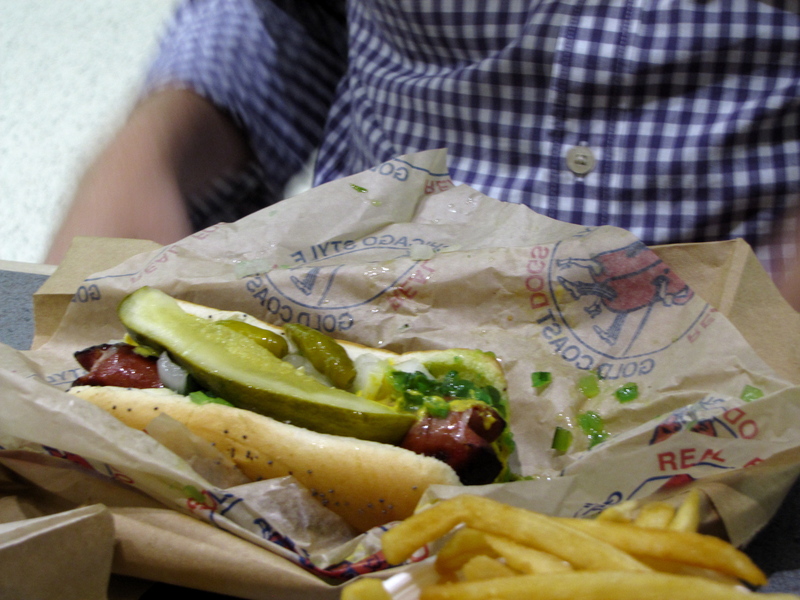 According to their website, Gold Coast Dogs are the best hot dog in Chicago. That was from a contest ran by ABC 7 News…in 2003. Whether or not they are still Number 1 is up for what would be a heated debate, but I couldn’t pass up the chance to give them a try. After all, how could you pass up a dog at the airport just before your flight out of town? 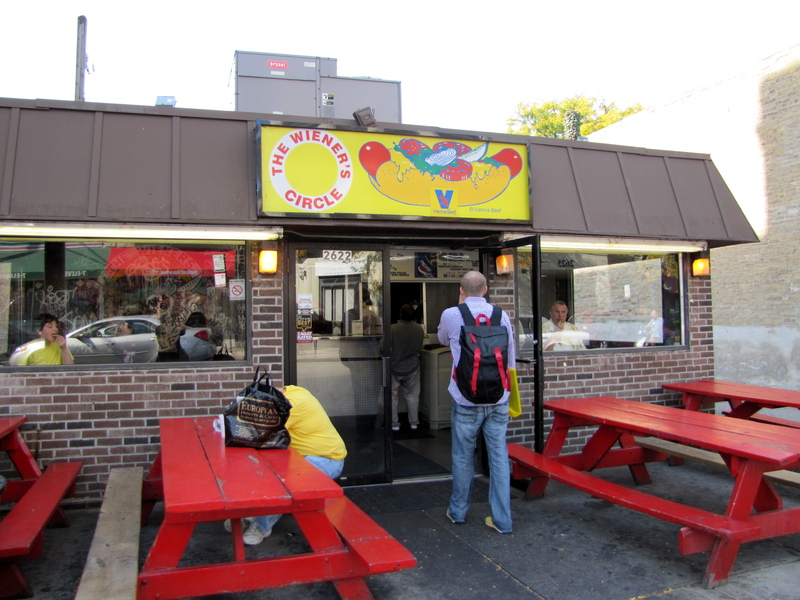 As I write this two months after my trip, I am craving a Chicago Style Hot Dog and while Wiener Circle was my favorite dog that I tried, Gold Coast did not disappoint, even at Midway airport. They actually have 10 locations in Chicago, with 3 in O’Hare Airport as well. Onto the star of the show dog – delicious Vienna beef dog, big time flavor. They are offered either steamed or char-grilled. I am a fan of steamed dogs when they are done up right, but when given the choice I could not in good conscience, pass on a char-grilled dog. The dogs are grilled until slightly blackened, which adds another tasty layer to the already outstanding flavor. The encased goodness sits inside of a fresh poppy seed roll, topped with crisp, colorful condiments. The server did go a little heavy on the celery salt, but with a line that was easily 20 deep, who can blame them? Employees churned out dogs to the starving crowd with quickness. They may not update their website very often, but what they are good at is very tasty Chicago-Style Hot Dogs. Highly recommended as your immediate first stop once you touchdown in the Windy City. 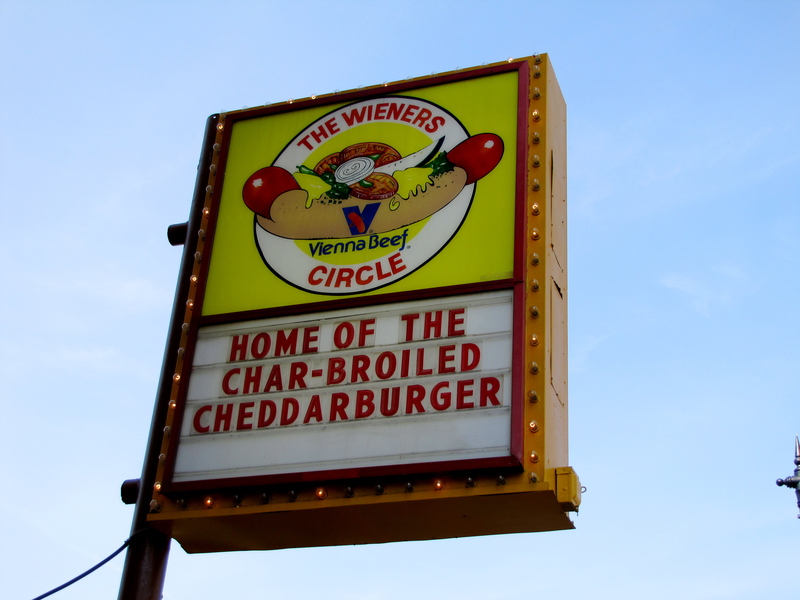 The cheese fries at Wiener’s Circle might be just as famous as their dogs. I didn’t want anything to taint my dog experience at the Circle, so I elected to go without fries. That was a mistake. They smelled and looked unbelievably good…fresh cut and salted right out of the fryer. Cheese fries are on the list for the next visit (there definitely will be a next visit), as is a burger, which I hear are also fantastic. The place itself has a lot of character. There are stools for about 6-10 people inside and also some picnic tables outside as well. You just step right up to the counter and place your order to the trained professionals that are all business. And that business is serving up phenomenal food that will have you craving more almost immediately. The dog was the best I had tasted in a very long time. It’s a well done char dog, which I am a big fan of. Steakhouses hate it, but I love well done meats and dogs are no different. All of the Chicago Style condiments are available. As a curveball, I tried grilled onions instead of raw on my Wiener’s Circle dog. Love that option and it was amazing. That sold me, this was the spot. I could see this being a potential excellent late-night snack stop as well. 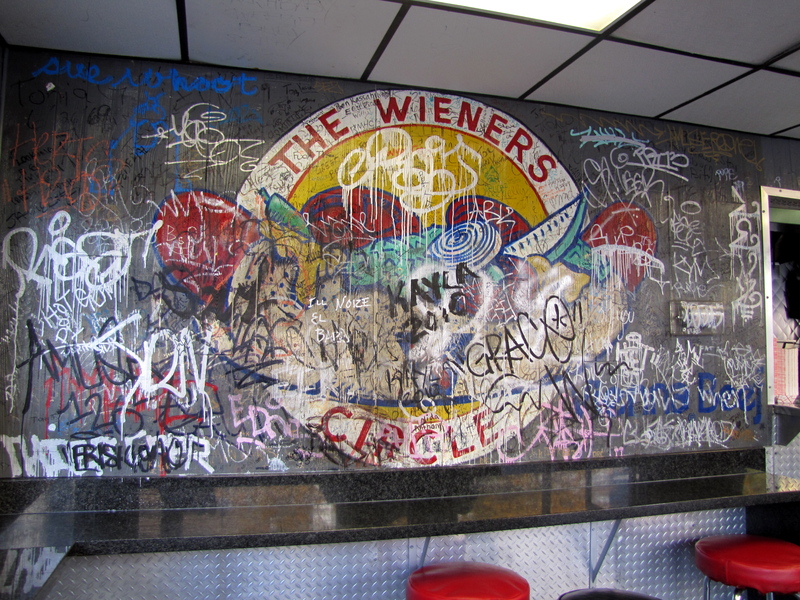 The Wiener’s Circle was in the winners circle for me as far as Chicago Dogs go. My first Dog stop in Chicago was supposed to be at Doug’s Hot Dogs, but they were closed both days I was there (disappointing!). Plans needed to change ASAP, because I could not go a half day in Chi-town without getting to a dog place and finally trying my first Chicago style dog. Enter Superdawg Drive-in, who I have seen numerous times on TV, including the Food Network. 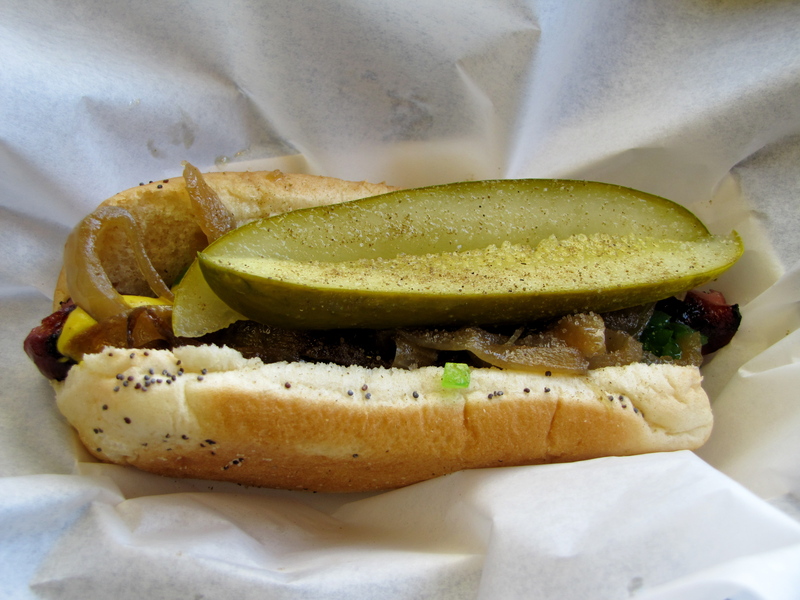 Steeped in history, Superdawg was touted as a must visit for anyone in the Chicago area. We stopped by for a late night treat. 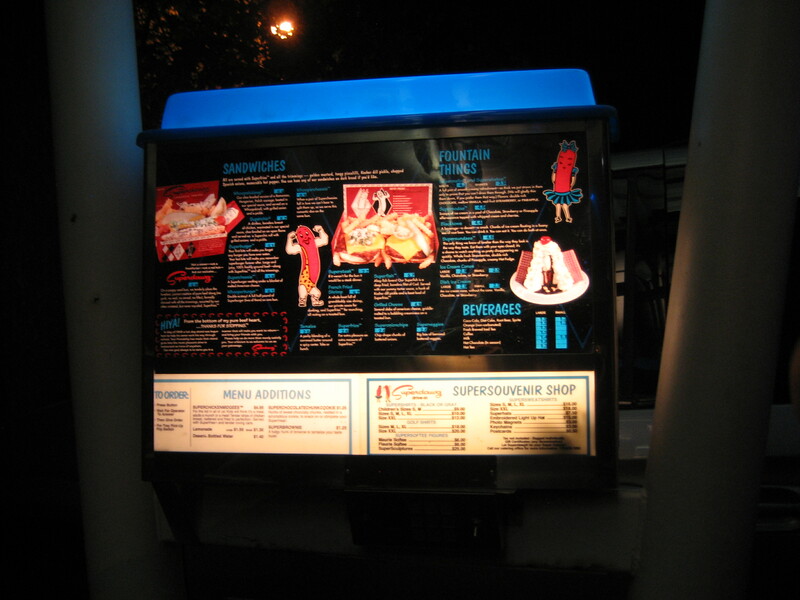 Superdawg is an old school drive-in, which adds to the charm. They have a simple menu that gets right to the point because it is all about the dogs. 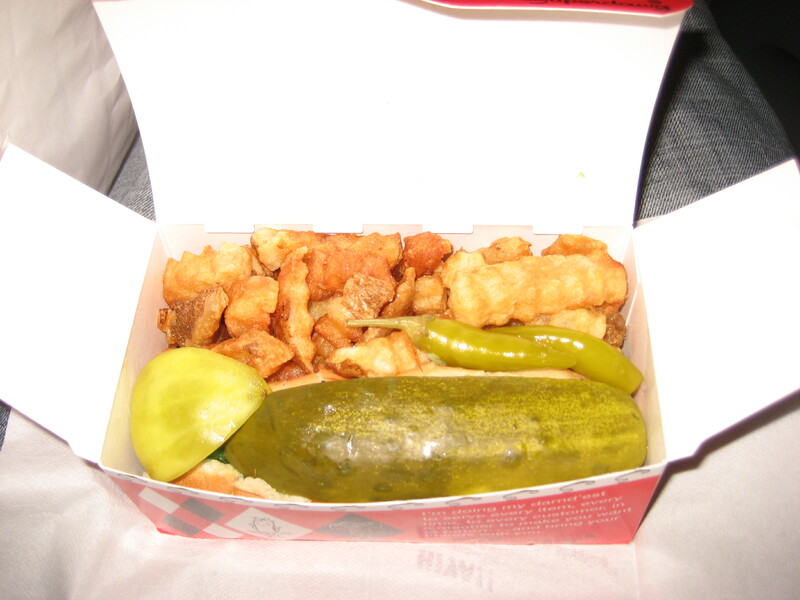 I got a Superdawg naturally, which is a solid all beef dog with golden mustard, tangy piccalilli, kosher dill pickle, chopped Spanish onions and a hot pepper. A bit more than I am used to having on my dog, and did I mention that it all came neatly packed in a nice little box over fries? The dog itself was good size and tasty. The poppy seed roll could have been better and the toppings were solid, but uninspiring. Service was friendly and even at almost midnight, the parking lot was bumping. The fries were good and of the crinkle-cut variety, but the most memorable part of the experience was the milk shakes. Rich, creamy and delicious. Highly recommended to help wash down a dog! So while Superdawg is definitely a recommended stop for tourists and dog lovers alike, it’s more for the atmosphere and the milk shakes than the dogs themselves. I don’t usually enjoy an overload of condiments on my hot dogs, so the Chicago Dog seemed a bit much, but I have always wanted to give it a try because it does get so much love in the hot dog world. 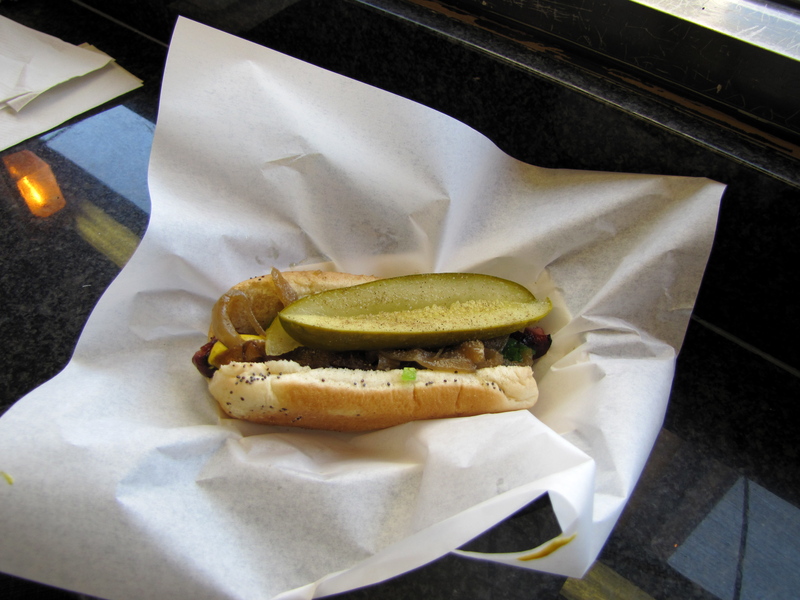 Last week, I was in the Windy City for a few days and I was able to hit up three different dog spots. Last week, I had the pleasure of dining at “urban tavern” Post 390 in Boston. Not only did they have a pretty solid beer selection (including my favorite IPA of the moment – Bear Republic’s Racer 5), but they had a hot dog on the menu. Not just any hot dog, a half pound Kobe Beef hot dog for $14. The rest of the menu looked to have some fine options, but I could not pass up my first taste of a Kobe Beef dog. There is also just something about ordering a hot dog when everyone else is eating stuff like steak or lobster bolognese. Before I get to the meat, I have to mention that Post 390 deserves major props for having Deviled Eggs as an appetizer. With that out of the way, I am sure you are wondering how the dog was. Well, it was huge. I expected the girth of the dog, but it was almost a foot long as well. You could definitely taste the quality of the meat. 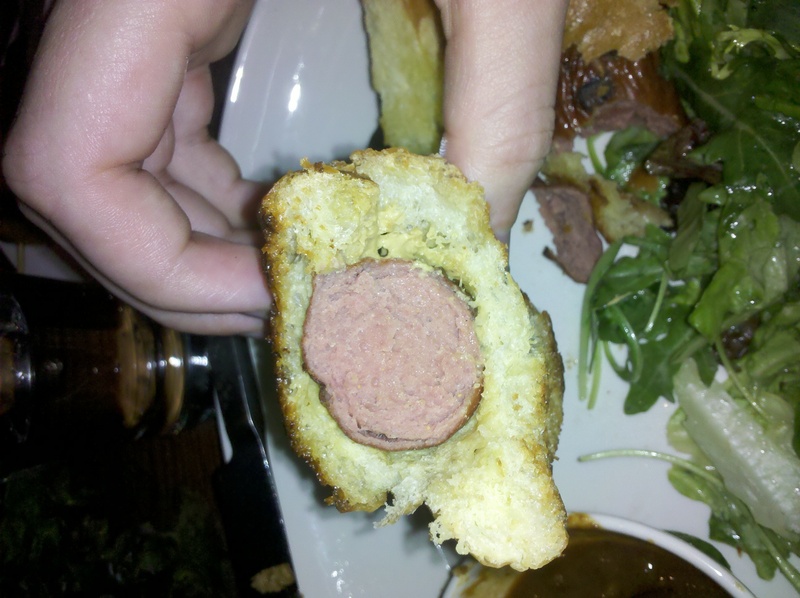 It tasted like so much more than a hot dog. The dog itself had a healthy, pinkish red color to it. Each bite was full of huge flavor. As a strategy I cut mine in half first, so that I wouldn’t lose too much of the bun to beef ratio that I like to keep, especially when eating an oversized dog. Speaking of the bun, it was legit. You could have piled toppings in it and it was going to hold up. That is quality. Speaking of toppings, they offer it “dragged through the garden” which gave you relish and some veggies. I choose to eat it straight up with just some mustard. I also scooped some of the delicious baked beans onto my dog. They were cooked with real half inch bits of crispy bacon which added that much more to my dining experience. Plus, they had a very smoky Chipolte Ketchup to enjoy the fries with. 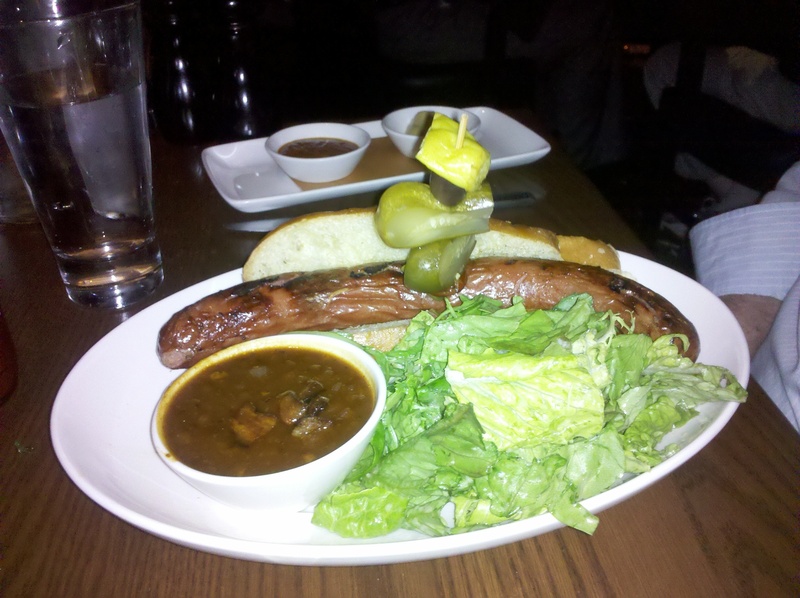 The Kobe Beef hot dog is not something I would eat regularly, but more on special occasions. I am glad I gave it a go though, it was a hot dog experience like no other I have had. It is a must try. It’s a Tuesday night, but I am already looking forward to Sundays. As summer winds down and we turn to football season, there is nothing like a hot dog or three on a Sunday afternoon. Whether you are at a tailgate or just relaxing, dogs are the perfect snack. 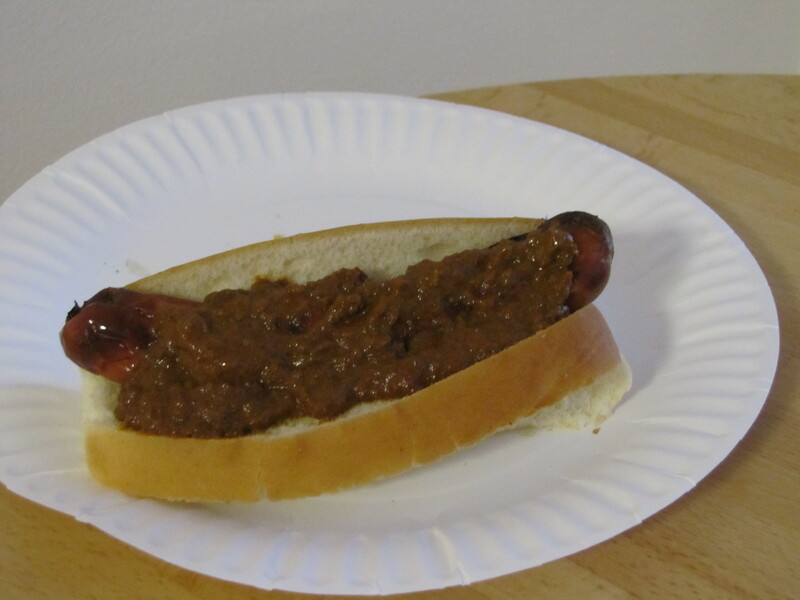 A few Sundays ago, I spiced up my dogs with some of Tony Packo’s famous chili sauce on some of my Maple Leaf hot dogs (more on those in the future). 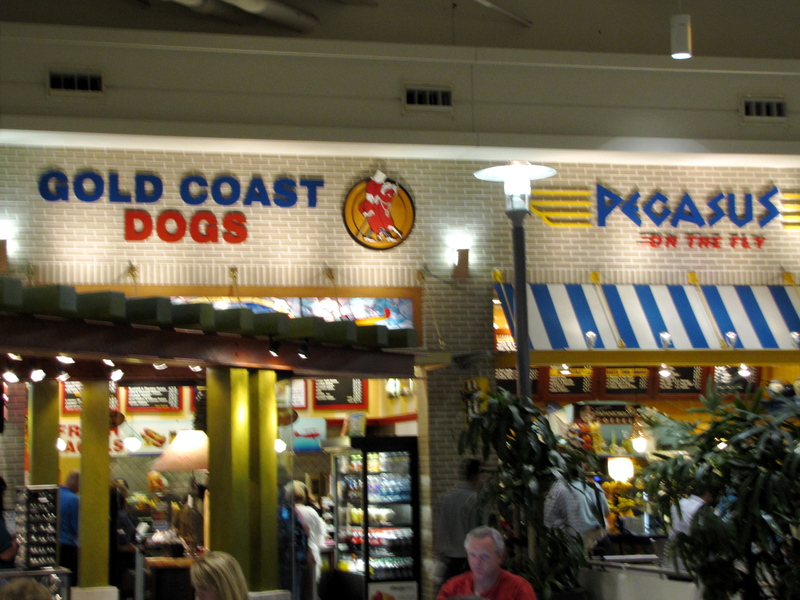 First, a little background: Tony Packo’s hot dogs are world famous. Founded in 1932 in Toledo, Ohio, they specialize in Hungarian food. They named their tasty dog the Hungarian hot dog, which became an instant local classic. After being mentioned on M*A*S*H in 1976, Packo’s started to gain nationwide fame. They were ultimately mentioned in 5 episodes of the hit show, even in the finale. Today, Packo products are available in 28 states. 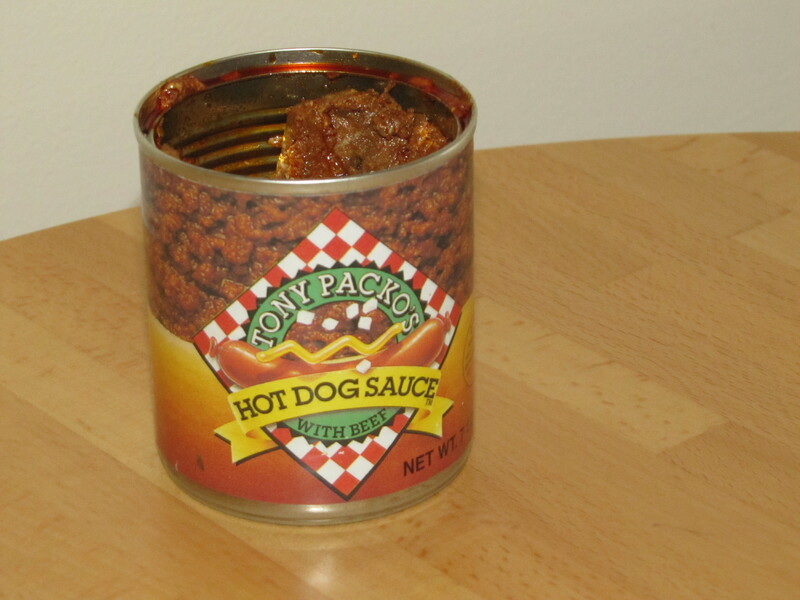 Now, on to the good stuff – the meat: Well, when you open the can, the chili sauce bears a striking resemblance to dog food, which in a way it is. Don’t let the initial appearance of it deter you though, because the sauce itself is delicious. Not overly spicy or chunky, it was a perfect compliment to any hot dog. I am someone who does not like the taste of the dog to be overpowered by toppings. This sauce is a must try for any chili dog fan.